NEW YEAR'S DELICACY: Don Freitas, left, and his crewman, Daniel Silva, hold up four ahi they caught recently. 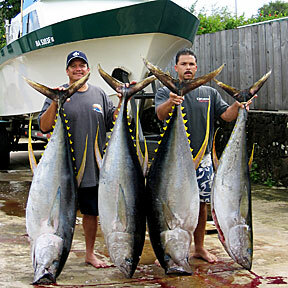 The ahi weighed 150 to 200 pounds each, enough to feed their families and friends. The minimum wage will rise to $6.75, but many isle employers already pay more. An annual tradition puts fresh fish in high demand, but the supply is down. Enter The Forbidden World Of Don Tiki. Hawaii had its chances to beat Penn but threw them away. Rights to build more Hawaii FM radio stations will hit the auction block beginning Jan. 12. City Council leaders have proposed ways to reduce property taxes as valuations have increased sharply.